This task will copy all items from the sources to the service which do not yet exist. The data to be pushed would be that which appears on your FitnessSyncer Stream, so we encourage you to first review that data before configuring this task as there is no undo once the data is pushed. Destination: Select the destination service to save the data. To see the data that would be used to synchronize, you can click the Export () link in the toolbar which will allow you to download the up-to the last 4 months of data for this destination. 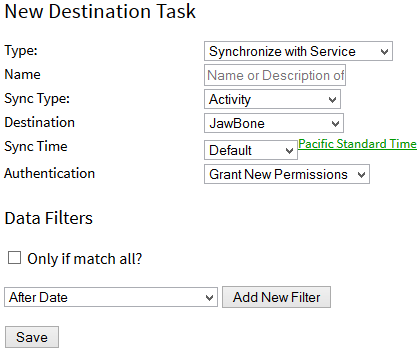 This is a great way to test out filters before synchronizing that data to the service. If you want to see everything, you should use a Cloud-based CSV Export instead.